Well now that you've had a betta for a few months, you begin to notice that your betta doesn't seem to be as active as he/she once used to be. Your betta just sits there only moving when it's feeding time. Or your betta swims back and forth pacing the tank. The natural reaction that betta owners get when they notice this lack of activity is to think that their betta is "lonely" and decide to get him/her a tankmate. However, this impulse to get a friend for their betta usually leaves the betta and the friend stressed, injured, and possibly dead. The problem isn't that the betta is lonely, but is no longer intrigued or interested in his/her tank. After living in the same place, with the same decoration, the same view, and the same routine for so long, bettas (and humans) are bound to get bored. Here are some ways to make your betta active again. After having the same plant and castle for its entire life, your betta is probably tired of seeing it and wants something new. It's similar to living in a room where nothing ever changes. The same blanket, the same rugs, the same pictures, the same everything. After a while, life starts to become plain, which is exactly what your betta feels. A new decoration or simply placing an existing one in a new location may be enough to spark some interest in your betta again. By placing the tank in a new location, you provide you betta a new view. This is like looking at the mountains all your life and then having the mountains replaced by the ocean. However, moving the tank may be a problem for heavier aquariums but is great for smaller ones. Wait, putting decorations outside the tank? Brilliant! If your tank is too heavy to move, you can place interesting objects outside the betta's tank. You can put colorful stuffed animals, shiny objects, pictures of your other fish, pictures of relatives who look like fish, the list goes on. Every few days, you can place a new object for the betta to explore. Another easy option to cure betta "boredness". Another easy way to stimulate your betta is to hold up a mirror so that it can see its reflection. It'll see itself and think that there is a rival betta next door and will flare and act tough. 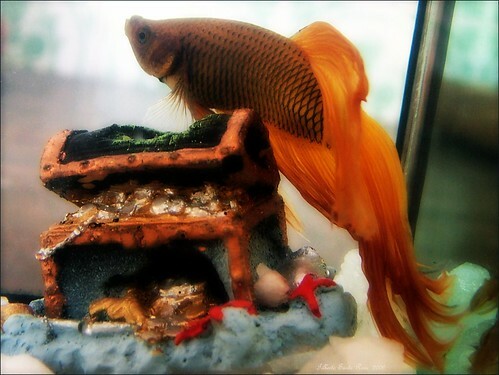 However, make sure that you don't leave the mirror there for more than 5-10 minutes or else you may tire out the betta. And when you do take the mirror out, the betta will think he/she has scared the rival betta away and won, boosting his/her confidence. Not only that, but the betta will become active again, patrolling its territory in case of another intruder. To your betta, you=food. So whenever you come near the tank, your betta will rush to the top for feeding time. Then once he's done eating, he'll just swim back down and stay there waiting for the next feeding time. However, don't make it that easy for him/her to get the food. You can play a game with your betta be dipping your finger tip in the water and stick the piece of food on the tip of your wet finger. Then, move your hand 1 inch over the surface and have your betta follow it around. He/she will try to get it and might even jump. After a few attempts give it to them and do it again. Instead of your finger, you can use those really thin straws used for stirring coffee. That way, you get rid of the possibility of poisoning your betta tank with soap or other harmful chemicals. Even if it's your favorite food, if you eat it everyday you will soon be tired of it. The same goes for bettas. Bettas enjoy variety, not just pellets or flakes. Instead, try to mix it up. Today, brine shrimp and tomorrow maybe some bloodworms. Additionally, not only does a variety stimulate your betta, but it is also one of the most healthy things to do for your betta. Balanced diet= healthy betta and healthy you. Yes, there are toys that bettas can play with. For example, a ping pong ball can be pushed around and nibbled by the betta. Marbles plus a clear bottom = soccer. The only concern is the toys containing chemicals that can harm your betta. Other than that, they are a great way to get your betta to be active. Another way to make your betta active is to teach him/her tricks. Bettas are highly intelligent and can be taught certain behaviors such as following your finger around the tank or swimming through a hoop. And with patience and lots of	time, you can teach your betta more advanced tricks such as pushing a ping pong ball into a goal or even into a hoop. Visit the betta tricks page to learn how to teach your betta tricks.